We are slowly getting back into the rhythm of home-edding alhamdulillah. (I miss my stitching!) I’m honestly not an unschooler (don’t hang me! ), so while I do enjoy down times and vacations, I do get a litttle anxious and start stressing about how much more we need to do. I’m not the kind who expects the kids to do a lot of written work, but I do want their days to be productive. It doesn’t help that I always want to do more with the kids – we always have a million projects we want to delve into, homeschooling and otherwise. Marz has been working on her writing. She has been doing reports on Science and History and although she needs to work a little harder on her spelling (it’s more carelessness than anything! ), I think she has done well in this area, alhamdulillah. She likes doing research and enjoys ploughing through different books, compiling information and writing it all out. Alhamdulillah our local homeschooling co-op run by my friend Umm Aymun has helped a great deal in this respect. The bi-weekly meetings have given her a sense of purpose and urgency in writing things out well and on time. 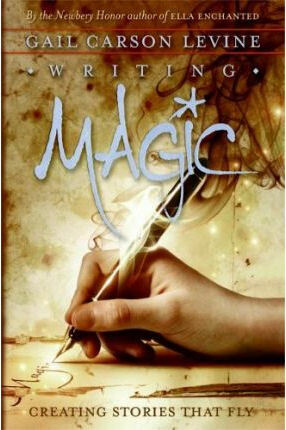 Writing Magic shows how one can get ideas for a story as well as how to develop and revise it. It guides writers on how to add details and dialogue and appropriate use of words. It even gives some advice on how one can sell one’s work. Levine is quick to show becoming a writer is not a bed of roses – she herself has had work rejected. However, these are setbacks that can help a writer grow further. Levine writes in a personable way that really reaches out to her readers. She tells them not to throw any of their work away or to abandon ship when the going gets tough. She is encouraging and takes her readers’ dream seriously and helps them believe in themselves. I like that this book has fired Marz up – she looks forward to tackling the exercises and spends a great deal of time plotting out her stories. Masha Allaah nice. I wanted to ask you, how do you select books for each age or grade for your kids? Do you have a list of books you use. I saw your 2009 and beyond posts and the books that you have mentioned there. Are you doing all those books each year ? Are you still using all of them? How do you divide them for each year? I am not sure if you were asking about text books or books for general reading. With us though, the lines are very blurred. We don’t rely on textbooks alone for our studies because (I know I say this a lot) we prefer to use living books. We do of course have encyclopaedias and textbooks but we prefer to go beyond them so that we don’t just learn the facts but can see them in action… from a living example. My kids learn Geography and History more from living books than text books and this I think helped them appreciate the human aspect better as the living books touch an emotional chord. We do have textbooks for Math and Science – this is only so I have a fair idea of what is being done in the Singapore system (in case we ever move back there). I don’t stick to them strictly… I have my own recipe so to speak, particularly for Science. Math is largely straightforward although we do spend a bit of time on some living books. We generally follow the scheme of work for Singapore Math and only vary the pace. I slow down a lot where Mars is concerned because she is not a Math fan. With Bear, it is the opposite – she loves Math and can do reams of worksheets at a time. For Science, we loosely follow the Singapore scheme of work and use our own texts and meander quite a bit! Lots of documentaries and notebooking. I don’t worry about books being age appropriate – by this, I mean I challenge my kids to read books that may be for older age groups. I don’t buy simplified books because I think they insult kids’ intelligence – kids can absorb so much and there is no need to dumb things down for them. If they can’t read the stuff yet, read it to them and it will teach them to pay attention and concentrate. Reading more difficult books exposes them to rich vocabulary as well. Of course for fiction, I will check for things like shirk, boy-girl themes and other unIslamic elements. If they are too dominant, then the book is not allowed. If it is not … how do you say it… insidious, perhaps I will allow the book but will be sure to discuss it with them and to remind them of what Islam says. Basically, I do keep a tight reign on what the kids read. But OK back to the grade level issue. Other than for Math, I don’t choose textbooks or books by grade. Science, yes, to some extent, but even then we try to go deeper and wider wherever/whenever we can. English is good literature (whole books, not abridged) only for Bear, who is 6. Mars is going into grammar, vocabulary, spelling (because she is SO careless!) and creative writing. Mars’ texts are a mix – I’ve chosen for her to use books above her grade level and to spend more time now on writing reports and stories. The books listed on the 2009 and Beyond pages are like a bank – and I do add books from time to time :) – so it is supposed to last a few years :) If you would like a list of our reading books (as in not the text books), I am still updating the list on goodreads.com :) In shaa Allah will let you know once it is done! Jazzakillaah Khayr. Yes I understand what you say and I like it that way too. I want Maimoonah to be serious and do serious things not babyish stuff lol so I like to chose books that are challenging. In my case I need a guide to just know what I am supposed to do and how to get about it. I am doing Grammar with Maimoonah now and the books look good as she is only four. It has a reader and a work book which explains itself and she understands well masha Allaah! I wish I can do things the way you are doing with books, but I guess I have along way to get there. Now for next year when she will be 5 years Insha Allaah, am thinking what books to use and how to get about things. Its better I start now and look out for stuff Insha Allaah! Yes please do let me know when you are done with goodreads let me know. Thanks for all your time explaining and surely will be a benefit for me Insha Allaah! You know Umm M, I think you are doing wonderfully well ma shaa Allah! There was a lady I met once from Qatar – she had family in Islamabad. I’ve been trying to locate her as I’d lost her contact details after my computer died on me. She was crazy about books too :) We would bring suitcases filled with our favourite books so we could compare titles and talk about them :P One of the things she did was to join some kind of Scholastic book club. I am not sure exactly how it operated but it allowed her to order books and hold book parties (you know, kind of like Tupperware parties where people order through you?). This helped her get discounts as well as affordable shipping. Are there any other home-ed families in Qatar? Oh Jazzakillaah Khayr for the compliments, especially coming from you!!! Yes I think there are some American and British sisters home educating their kids and most of them follow online programs I hear. But so far no Home ed groups. One sister is trying to organize a small club for girls but even that did not get off due to not enough of kids. There is a very active Home Ed group I hear run by expats but all are non Muslims and as you know we have issues joining them. It will be so nice to know if that sister is still around here and I can get in touch with her, I remember you telling me about her some time back at Ihsan Forum. Yes masha Allaah you are indeed having a great method of teaching and I know the benefits of it. I agree I very strongly feel text books are not enough and should not be enough. What I meant was if we need the kids to excel in exams then we need to cater to it too and I agree CM method does not fall short of it Insha Allaah! Yes of course priority is Islaam and I so wish that if she could sit under a scholar and learn her dheen in the years to come Insha Allaah! I was telling my husband if they do have a Girls’ wing at the Madeenah Uni by the time she is grown I really do not mind sending her there to learn from the scholars and act upon the ilm she gains Insha Allaah!